When you’re making a game, inspiration can come from the strangest of places. When a bunch of independent game developers are making their own JRPG, you might imagine their inspiration comes from classics in the genre like Chrono Trigger, Final Fantasy VI, or Earthbound. Sometimes, however, it’s not that simple. Not when you bill your game as both the canon sequel to not only a rather forgettable street basketball game from the mid 90s, but also Space Jam. The game’s official storyline status is confirmed to you the moment you begin the game, and that’s just about the most normal thing you’ll see through the entirety of the game. As surmised from the title, Gaiden is an odd, odd game. 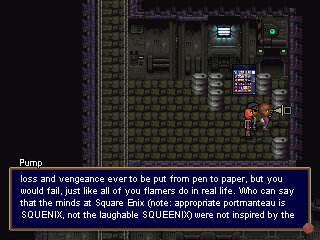 One could technically consider it a parody of a JRPG, if they really wanted to define it. Unlike so many similar attempts, however, it goes far and beyond the low hanging fruit of pointing out odd hair styles, useless townsfolk, and the collection of power crystals. What makes Barkley work is just how many different sources it pulls from to make its odd blend of humor, all mixed into a blend that’s sometimes hilarious, often confusing, but at the very least, always entertaining. While you don’t have to be much of a sports fan to enjoy the game, despite its theme, a casual knowledge of different Internet subcultures can help make more of the jokes stick. Much like certain places on the internet, at times it’s hard to be certain if there’s some hidden “joke” you’re not entirely in on, but it’s that sort of confusion, a nervous laughter on the part of the player, that makes Gaiden what it is. 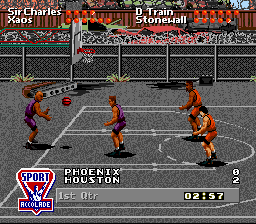 In the year 2041, during a heated basketball game, Charles Barkley unleashed a slam dunk of such unfathomable power that it destroyed the stadium and nearly everyone inside it. Twelve years later, the sport of basketball is all but dead, its best players and fans killed in purges led by the traitorous Micheal Jordan. 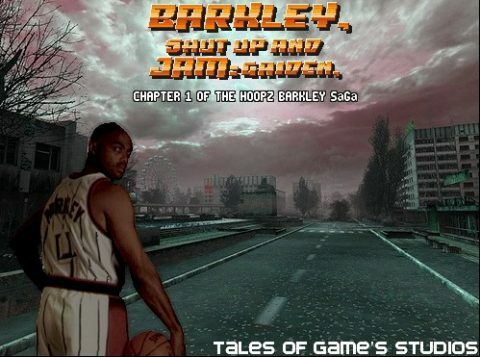 Barkley and his son Hoopz now live in hiding in a shabby apartment, trapped inside the sprawling “post-cyberpocalypse”. One night, another “Chaos Dunk” destroys Manhattan, killing millions, and since Barkley’s the only man capable of performing such a dunk, he’s the prime suspect. 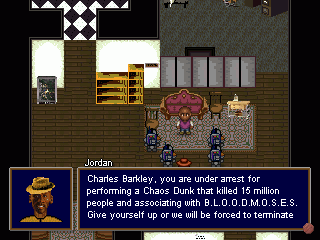 With Jordan attempting to hunt him down, Barkley escapes into the basketball tombs beneath the city, starting his quest to find his son, escape Jordan’s pursuit, and discover the truth of who’s behind the mysterious terrorist organization B.L.O.O.D.M.O.S.E.S. Charles Barkley: Former member of multiple NBA teams and one of the last remaining basketball stars alive, Barkley has aged incredibly well for a 90 year old. The knowledge that he performed the Chaos Dunk that destroyed basketball still weighs heavily on his mind, making him an angry, bitter man. Despite this, his love for his son Hoopz is what motivates him to continue his journey. 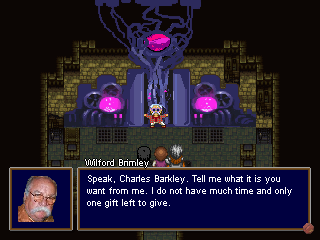 In combat, Barkley is a good all-rounder, capable of performing special slams and jams that perform a variety of effects. 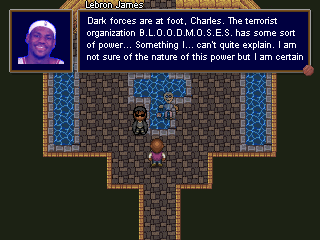 Balthios: The great-grandson of the late LeBron James, he’s initially thought to be a member of the terrorist organization B.L.O.O.D.M.O.S.E.S. After helping Barkley escape from Micheal Jordan, he serves as Barkley’s companion and mentor. His defense isn’t great, but he specializes In debuffing enemies, along with using a few highly damaging “Zaubers”. Cyberdwarf: He apparently comes from an entire planet of dwarves, but when he crash landed onto Earth, he was forced to have basketballs grafted onto his skin to survive. He joins up with Barkley’s party to search for Hoopz, who Cyberdwarf believes to be the “Chosen One”. He also makes it very clear that he likes women with “applebottoms” and will accept nothing less. Cyberdwarf makes for a pretty great healer, although he can also use his attack combos to damage and debuff his enemies. Hoopz: The only son of Barkley and his late wife Maureen, Hoopz believes himself to be an ordinary child, until he’s kidnapped by Micheal Jordan and nearly killed. Even after he’s rescued, he’s constantly being hunted down by Jordan, who wants to stop Hoopz from realizing his great destiny. Thankfully, his vast knowledge of “vidcons” often proves to be useful to the party’s quest. In combat, Hoopz is a deadly “Gun’sbraster”, using a variety of Gun’s to brast enemies with powerful offensive techniques. His art is taken from Skate from Streets of Rage 2. From a gameplay standpoint, Gaiden resembles your typical JRPG fairly closely. Most of the game has you travelling straight from one area to another, often some manner of dungeon, with the occasional setpiece to keep things varied. Despite the generally linear nature of the game, there’s still plenty of reason to explore around the various dungeons. There are alternate routes to take to avoid combat, and taking a detour can often lead to hidden items. Generally, however, the way ahead is always obvious enough that you’ll always know just where you need to go next, and once you clear one area, you’ll rarely, if ever, need to return. You’ll also find the occasional town every so often, where you can upgrade equipment, buy items, and grab one of the game’s few sidequests. 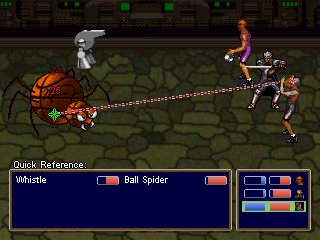 Combat is also in the typical JRPG mold, without too many extra complications to worry about. One interesting thing is that each character’s basic attack will activate a small minigame, succeeding at which will inflict extra damage on foes. 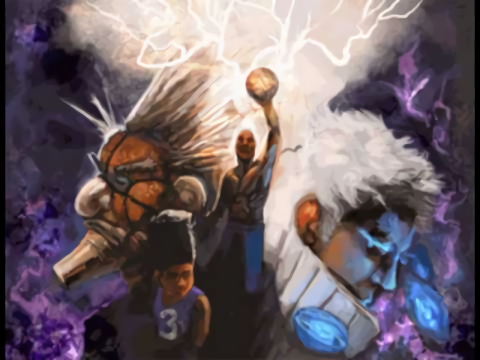 Barkley, for example, has to wait for a cursor to reach a middle of a bar to aim his free throws, while Cyberdwarf can tap out a combination to inflict damage and status effects. It’s something that requires you to pay a little more attention to what you’re doing, which, given the standards set by most JRPG combat, is pretty nice to see. Enemy health bars are clearly visible, giving you a clear idea on if your tactics are working, and the game always shows you which buffs and debuffs are currently in play. While neither exploration nor combat are especially groundbreaking, there’s enough care and good ideas that neither ever becomes frustrating. 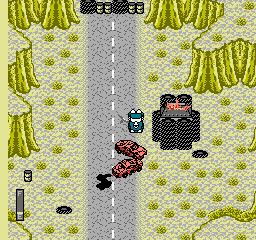 On the overworld, enemies can be clearly seen, similar to Earthbound, meaning that if you’re quick, you can surprise or avoid combat encounters entirely. If that fails, however, any combat encounters you clear will generally never respawn, which means there’ll never be a point in the game where you’re forced into fight after fight against your will. There’s an incountable number of features that make the game far more pleasant to play, even things as small as healing items healing a percentage of lost HP, rather than a set number. For what’s ostensibly a parody of the genre, it’s shocking how well the game manages on so many aspects of the genre’s design. These improvements do mean the game is somewhat easier, and far shorter than most higher-budget examples of the genre. This can be seen as more of a blessing for some people, however, as it leads to a game where you’re never forced to wade through too much filler to reach the next part of the story. The pacing always remains quick, constantly introducing and dropping new mechanics, and given the game’s bizarre nature, you’re never entirely certain what you’re going to find next. A complete playthrough might only take you a handful of hours, but there’s hardly a moment in the game stretches on for too long. It’s also not really the hardest of games, as levels are gained quickly, and the game’s best healing items aren’t too difficult to stock up on. The game only really gets challenging with a handful of boss fights, and it’s an incredibly rare occurrence to actually die through combat. 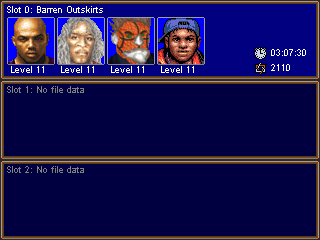 It’s the world the game places you in, and its bizarre sense of humor that really makes Gaiden shine. In this world, basketball isn’t just a sport, it’s a full on religion. 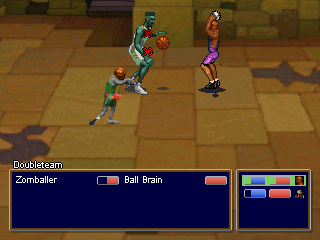 You’ll explore the tombs of deceased players, equip items like sweatbands and referee uniforms, and face foes like spiders made of basketballs. The events of Space Jam are treated as canon, and the events of that movie form the plot of the game proper. It’s a theme the game never stops running with, no matter how absurd of a plot it makes for. While the basketball theme permeates the game, from the way characters constantly discuss the sport to reverence, even to the names of the status conditions, the game doesn’t require much sports knowledge to play. What really makes the game’s sense of humor work is that despite all the various references to internet subcultures and gaming tropes that you’ll encounter, the story plays them entirely straight. 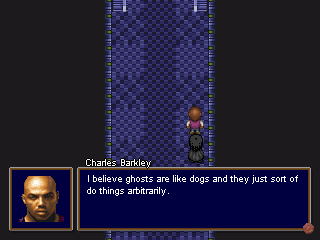 When you meet a community of furries living in the sewer, the game treats them as their very own culture, distrustful of “norms” and subject to Barkley’s contempt. 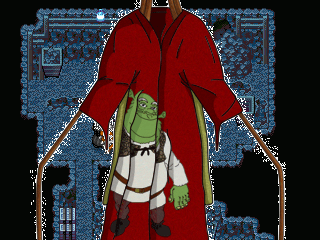 When an NPC offers you a kimono with Shrek on it as a quest reward, it’s treated as nothing less than a legendary artifact forged by a master craftsman. Most notably, every save point in the game delivers a massive rant by a gentleman who holds a very, very opinion of Japanese culture, the sort of fellow that all of us have encountered sometime in our internet careers. A lot of the game’s sense of humor can be described as “ironic” humor, where things that often don’t make sense just happen, without so much as a word of explanation. Why is the Game Over screen attributed to Kurt Cobain, despite having no quote? Doesn’t matter, here’s a guy talking about how great Drizzt Do’urden is. 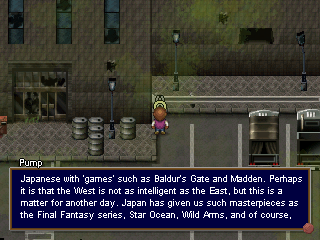 The rest of the humor is counting all the ways Gaiden uses so many different gaming tropes from JRPGs and other genres alike. 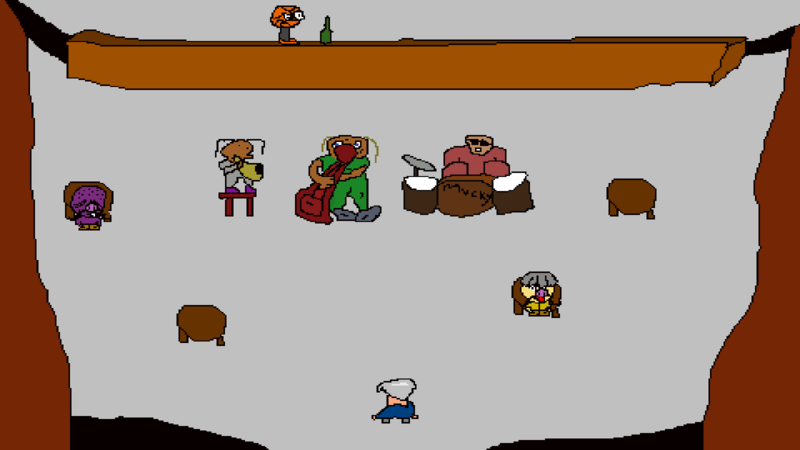 You’ll run across a job board partway into the game, which offers a single, mandatory quest, and then does absolutely nothing for the rest of the game. One area offers multiple options for everything you interact with, which does nothing useful aside from eliciting silly comments from Barkley. The JRPG clich?s all make an appearance as well, from the party member who’s clearly too awesome for you to keep, to the one-on-one final duel between the hero and his rival, to the final boss who never gets so much as mentioned until you actually encounter him. What sets this apart from your typical lampooning of JRPGs we’ve all seen so many times is that all this is never pointed out in the story. It would have been so simple for the game to laugh at itself and all of its tropes, but since they’re presented as serious events the characters have to deal with, the satire is far more effective. The graphics are rather amateurish, and you’ll find plenty of graphics borrowed liberally from sources like RPG Maker, as well as classic games like Streets of Rage 2, and, er, X-Calibur 2097. There’s not much in the way of consistency, since the game goes from looking like your average RPG Maker project on the overworld, to a bunch of sprites taken from wildly different games in combat. At the very least, the music is generally more original, and while it’s not very noteworthy, there’s clearly been effort put into it. Not all of it is entirely new however, as you’ll find when the boss theme from Blue Dragon kicks in during certain battles, complete with Ian Gillian’s high-pitched vocals. The main theme, a remix of Quad City DJ’s “Space Jam”, is particularly great, and it’s great to hear it flare up at the game’s most climactic moments. Overall, no matter your thoughts on JRPGs as a genre, Gaiden is absolutely worth setting aside a few hours to play through. Even if you’re not a fan of the “ironic” humor, there’s a great game in there, full of smart design decisions and great pacing. A sequel, now taking the form of a twin-stick shooter/action RPG, has been in development for years, with the developers being annoyingly coy about an actual release date.